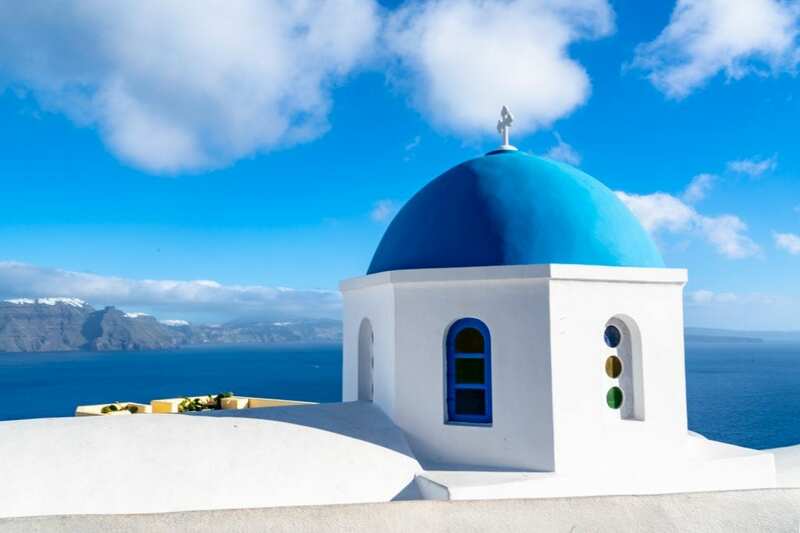 With its iconic blue-domed churches, whitewashed villages, and dramatic coastline, a honeymoon in Santorini is an obvious choice for couples looking to pair luxurious romance with a touch of adventure. Though Santorini is small, it’s also packed with exciting things to do and opportunities to invest in the kinds of once-in-a-lifetime experiences that a honeymoon often justifies. Planning a Santorini honeymoon? We’ve created this guide to make the planning process incredibly simple–after all, planning a wedding is enough of a hassle without the stress of pulling off a honeymoon right afterward, too! 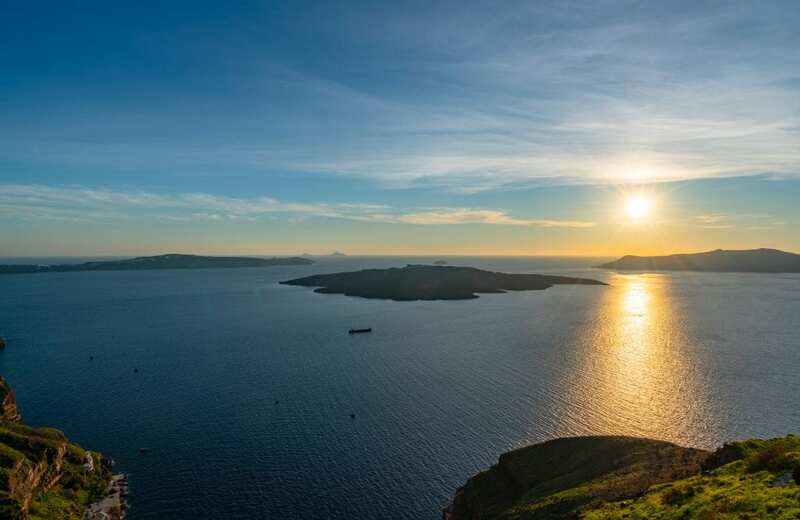 If there’s one thing you absolutely must do on your honeymoon in Santorini, it’s watch the sunset from Oia: this is the quintessential romantic activity in Santorini, and the dramatic sunset is truly magnificent set against the sea. Take a romantic catamaran cruise. You, your beloved, and the open sea: sailing around Santorini is a highlight of visiting the island, so be sure not to miss out! 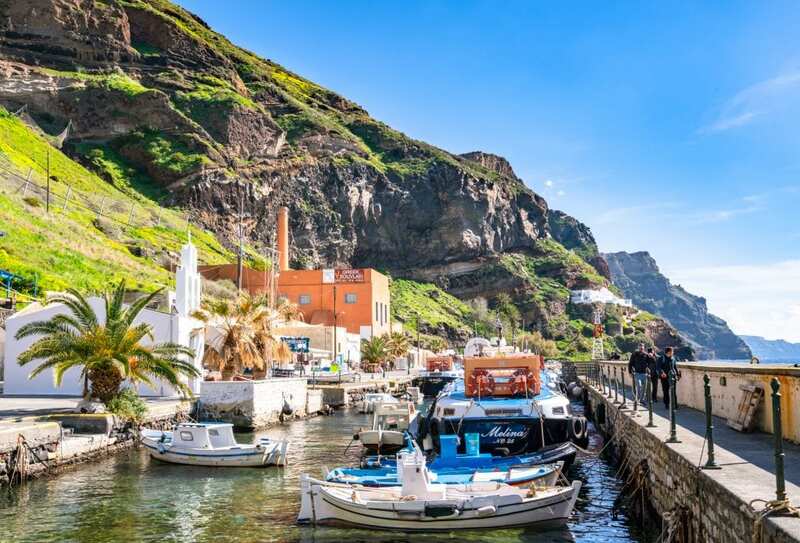 Whether you’re luxurious types looking for a dinner cruise or adventurous sorts who want to hit the hot springs, there’s a catamaran cruise on Santorini that’s right for you! For extra romance, ditch the giant tourist boats and opt for a smaller option with fewer people around. Book your romantic catamaran cruise today! Hike from Fira to Oia. 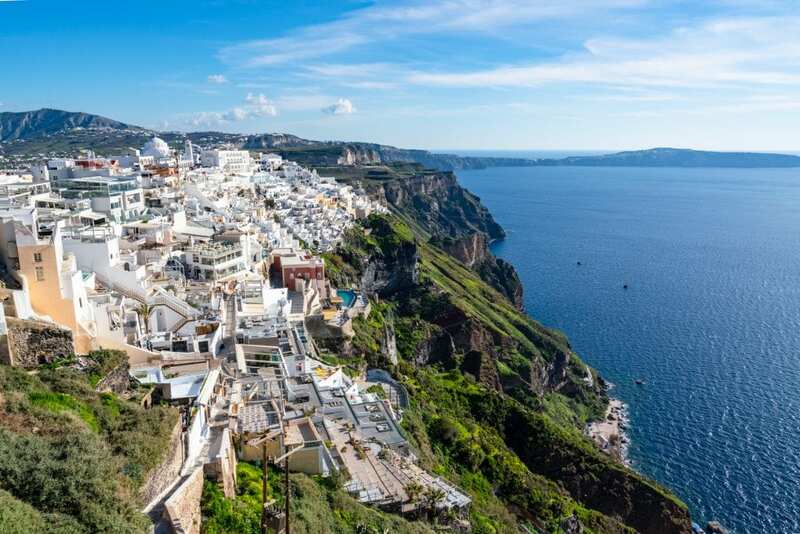 Hiking along the caldera from Fira to Oia is one of the most iconic things to do in Santorini, and absolutely deserves to be included on your Santorini honeymoon! 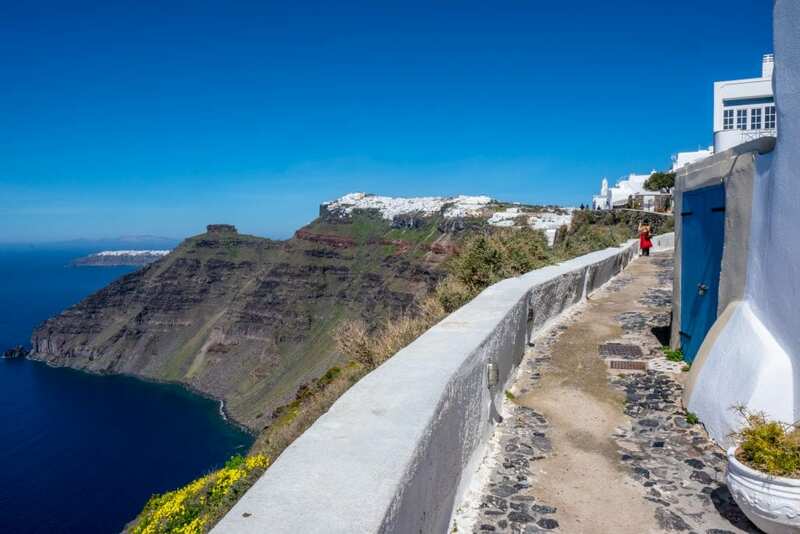 The hike takes roughly 3-5 hours, though it’s not technically difficult, and includes some of the most magnificent views you’re going to find on Santorini. 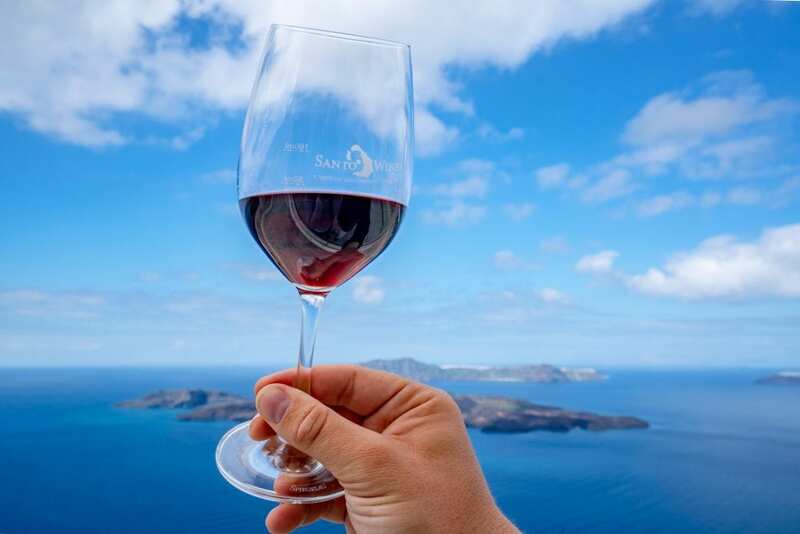 Santorini wine is delicious, and if you and your spouse are wine fans, you can’t miss this incredible feature of Santorini! We definitely recommend booking a wine tour to ensure you get to taste the best of the island’s wines without needing to worry about navigating transportation or choosing a designated driver–but if your tour doesn’t happen to take you there, definitely consider also heading to the Santo Winery alone before you leave for a quick drink and a long, long look at their stupendous views. Book your delicious Santorini wine tour now! Book a photography tour to get incredible photos of yourselves. There’s no better excuse to splurge on a photo session on vacation than your honeymoon! Book a photography tour to visit some of the best viewpoints on Santorini, while also ensuring that you get some magnificent photos of yourselves to commemorate your honeymoon with! Several years later, we cherish our honeymoon photos just as much as our wedding photos, and honestly wish we would have taken the time to get even better photos on our honeymoon–the photos we do have are such incredible mementos from one of the most special times in our lives. Book your Santorini photography session today! 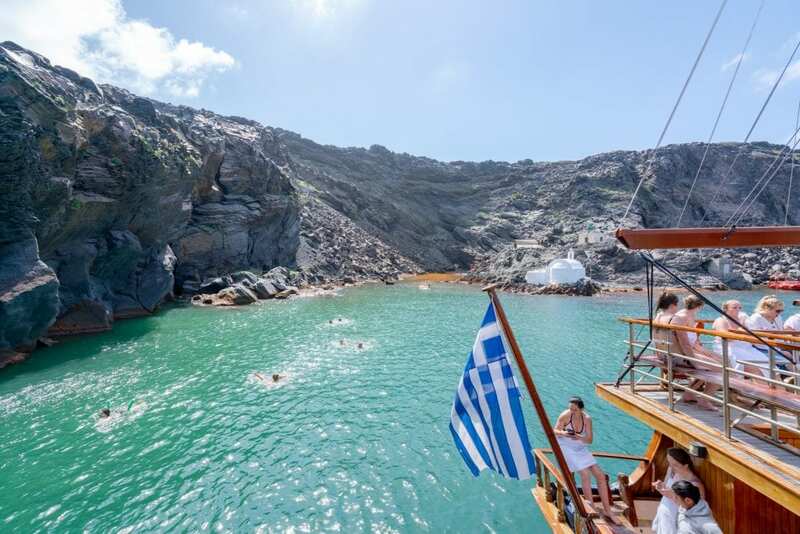 Go swimming at Amoudi Bay. Want to spend a laid back day in Santorini? Head to Amoudi Bay! The views are stunning, the water crystal-clear, and if you’re feeling a bit adventurous, you can even (carefully) try your hand at cliff jumping before settling down to a nice seafood lunch! Head to the hot springs & peer into a volcano crater. Ever wanted to peer into the crater of an active volcano? On Nea Kameni, the island located just next door to Santorini, you can! 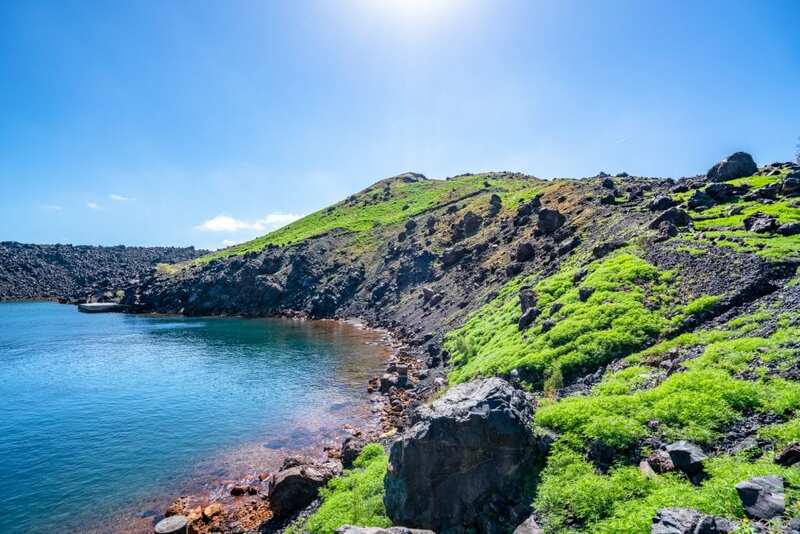 An easy 20-minute hike will take you from the dock to the crater, with absolutely magnificent views of the beautiful island along the way, with views of Santorini in the distance. The hot springs are located close by, and you can easily book a tour that takes you both places–we booked one similar to this and had an amazing time! Get cheesy honeymoon photos while riding donkeys. Riding donkeys up from the base of Fira’s Old Port to the village is a fun way to climb the large cliff, and makes for a fabulous honeymoon photo op! 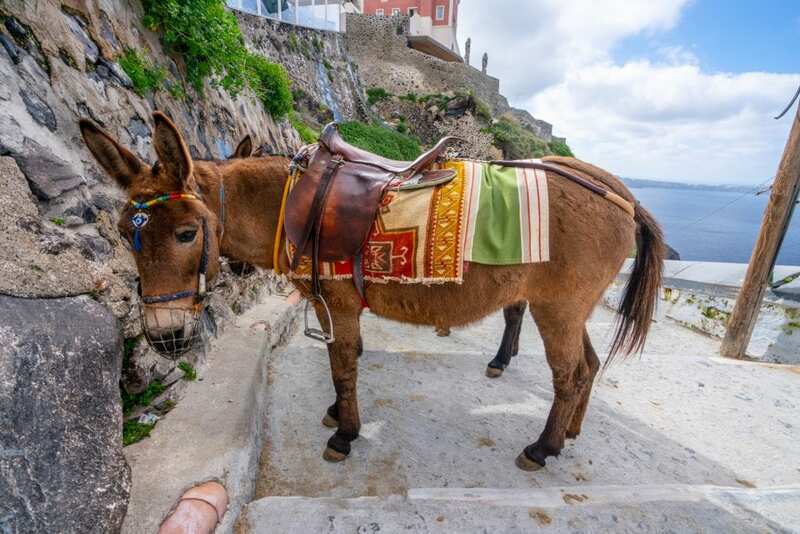 We recommend trying this on a day when cruises aren’t in port, to avoid both crowds and overworking the donkeys, but it is a very fun way to travel on Santorini! Ditch the crowds and take a private tour of Santorini. 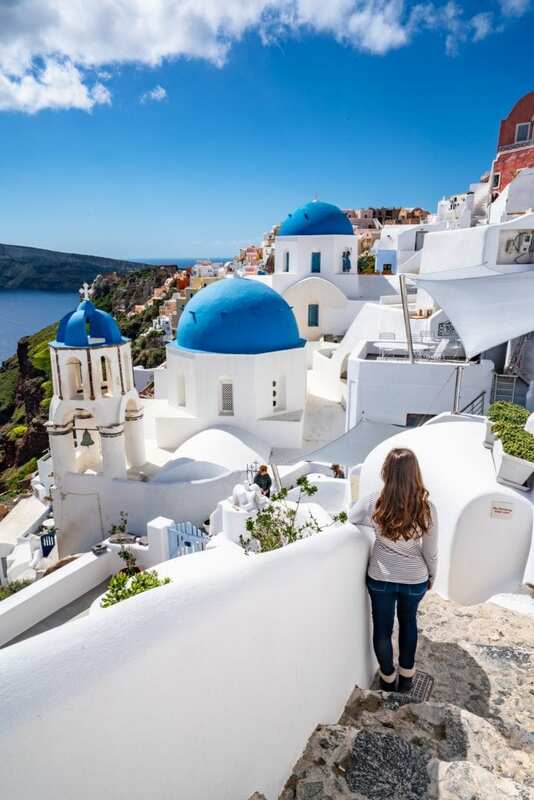 Group tours can be fun, but on a trip as special as a Santorini honeymoon, it pays to be alone: book a private tour of Santorini to see all the best spots on the island in luxurious comfort… with no one else around. This well-reviewed private tour is an incredible way to experience Santorini! Have dinner with a caldera view. At least once during your honeymoon in Santorini, be sure to indulge in a nice, long dinner during sunset at a restaurant with an amazing view over the caldera. 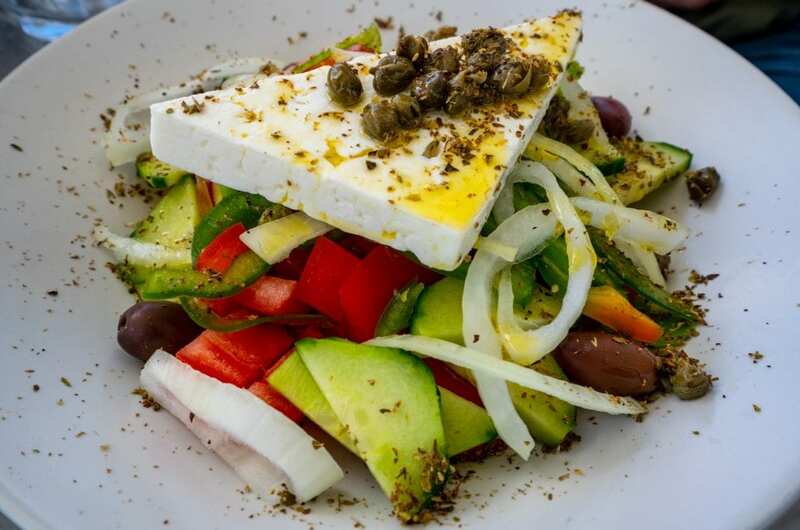 There are endless delicious choices on the island, so we recommend asking your hotel for one that is near where you are staying–as a bonus, they should be able to make a reservation for you (we recommend getting this set up as soon as you arrive in Santorini, as the best places do book up!). Check out one of the best bookstores in the world at Atlantis Books. 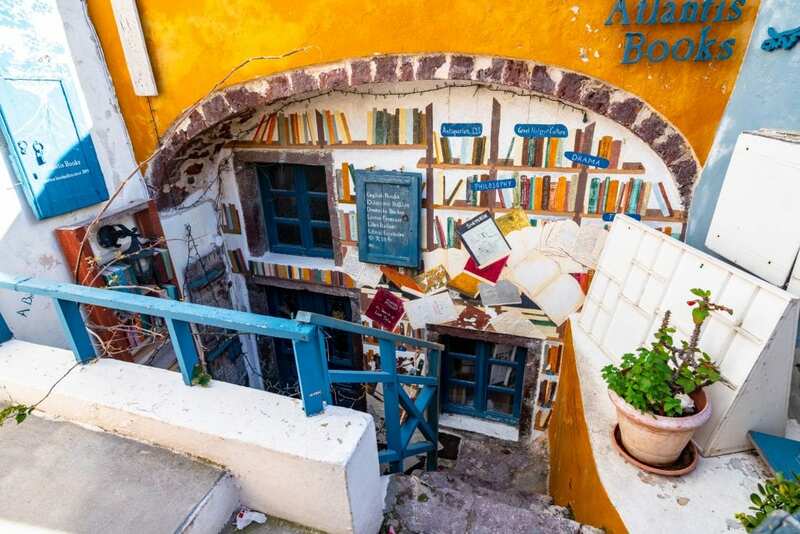 If you and your partner love visiting independent bookstores as much as we do, you absolutely can’t miss a stop at Atlantis Books in Oia! Run by expats and often recognized as one of the best bookstores in the world, Atlantis Books has strange hours that are worth working around–the brainchild of university students in their early 20’s, the founders succeeded in making an often-touted fantasy into a delightful and whimsical reality. Don’t forget to head up to the shop’s terrace for stunning views of the caldera! Splurge on a helicopter ride over Santorini. Want to partake in the ultimate luxury experience during your honeymoon in Santorini? Splurge on a helicopter ride over the caldera! If you’d like to (kind of) justify the splurge to yourself, you can also book a helicopter ride to another nearby island at the end of your stay on Santorini–Mykonos, for example–and combine great views with necessary transportation. Splurge on a helicopter ride over Santorini! Relax in Fira’s Old Port. 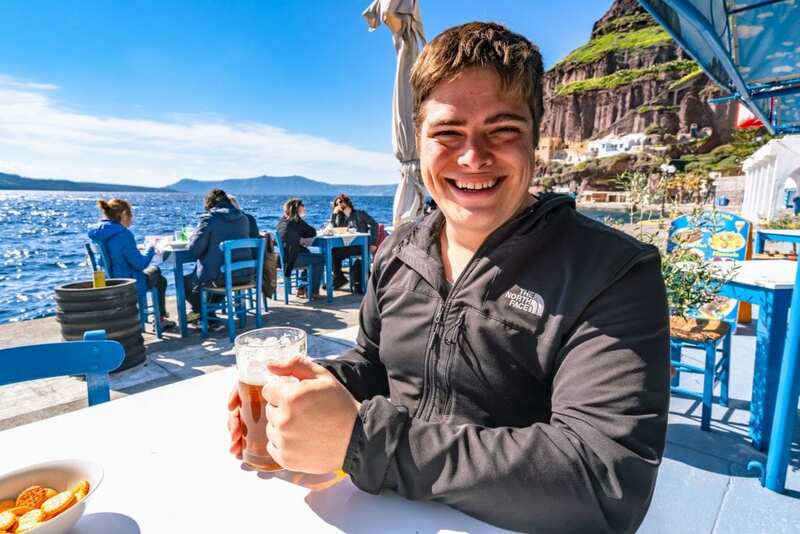 Beautiful views, lots of sunshine, and a drink in hand: relaxing in Fira’s Old Port is a great way to kick back and relax on Santorini–and unlike many things on a Santorini honeymoon, this one is pretty budget friendly! Learn a new skill on a Greek cooking class. Bring your honeymoon home with you: with a Greek cooking class, you and your new spouse can learn the ins and outs of delicious recipes that you can then recreate in your home for decades to come–plus, Greek food is so incredibly delicious that any excuse to make/eat copious amounts of it is a good one. Book your cooking class in Santorini today! Stay in a once-in-a-lifetime kind of hotel. We’ll provide some more detailed suggestions below, but if there’s ever a time to splurge on that epic villa, it’s on your honeymoon in Santorini! The best boutique properties book up fast, especially during the high season, so plan ahead as much as you can–but if you travel outside of peak season, you may be surprised at the deals you can snag for those magnificent hotels overlooking the sea! 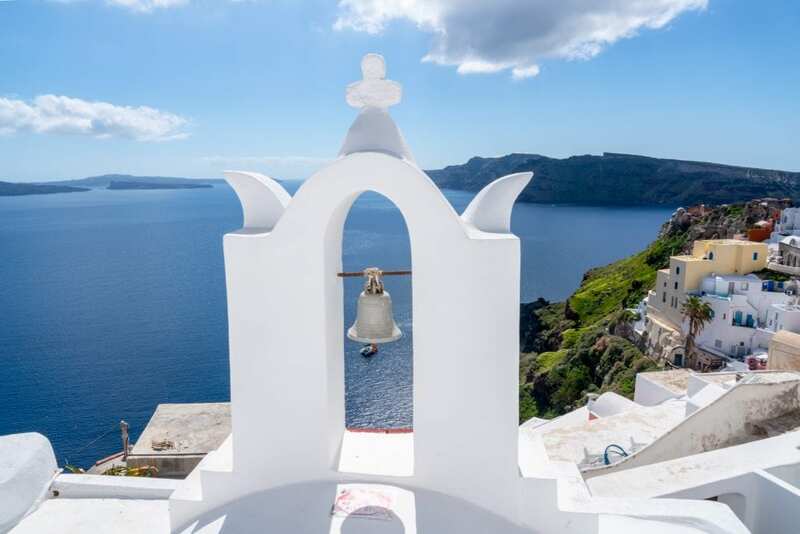 When choosing where to stay for your Santorini honeymoon, we highly recommend sticking to one of three villages if you can: Oia, Imerovigli, or Fira, in approximately that order, if at all possible. There are other places to stay on Santorini, of course, including the more-budget-friendly Kamari and Perissa, but for those iconic views and romantic honeymoon vibes, the villages along the caldera are the place to be. Choose Oia for incredible views and being near some of the best things to do in Santorini, Imerovigli if you want amazing views with a quieter atmosphere, and Fira or nearby Firostefani to maintain that classic Santorini vibe while saving a bit of money and still having good access to tours and attractions. 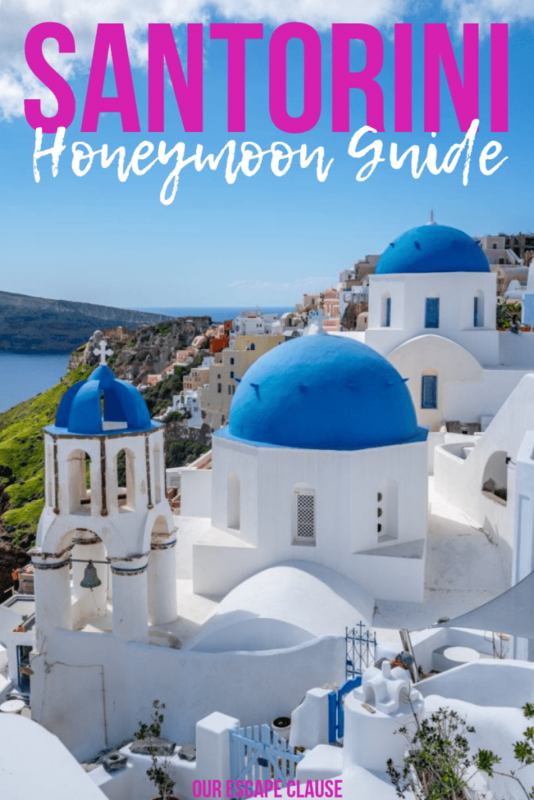 I’ve linked a few hotels below that will give you an idea of the price range and availability you’re looking at for your Santorini honeymoon, all of which receive excellent reviews and are located in one of the villages I’ve mentioned here. If you see a property you like and your travel dates are set, let me make a recommendation: book it! For that reason, I can’t stress enough: if you have a specific Santorini honeymoon experience in mind, book as far in advance as you can. Cleo’s Dream Villa — This stunning villa is a perfect example of the kind of luxury properties that are tucked into the cliffs around Oia. 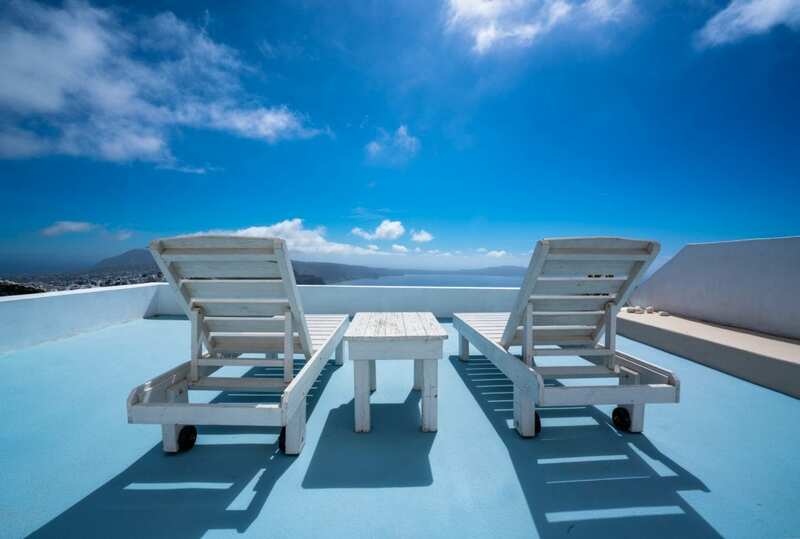 Located directly below the iconic blue domes and offering both a perfect location and plenty of privacy, this gorgeous villa is home to a hot tub overlooking the caldera, once-in-a-lifetime views, a beautiful interior, and a spacious layout. Delta Suites — This one bedroom villa set inside a cave is a fantastic way to experience traditional Santorini architecture while also indulging in the type of luxury that a Santorini honeymoon is all about. Enjoy stunning views over the caldera from your hot tub on the terrace, which is an absolutely unbeatable way to watch the sunset in Santorini. Check rates & book your stay at Delta Suites! Saint George Exclusive — The word that comes to mind for Saint George Exclusive is iconic. From the beautifully decorated rooms with bright white walls to the magnificent caldera views to the fantastic reviews, Saint George Exclusive is an excellent romantic option in Imerovigli. The terrace is shared, rather than private, but that does contribute to the (slightly) lower prices as compared to similar properties with private terraces. Check rates & book your stay at Saint George Exclusive! Amber Light Villas — Known for their attentive customer service and for having a pool, a spa and a delicious restaurant on site, if you’re looking for a luxurious place to stay in Santorini where your worries will float away, Amber Light Villas is the place for your honeymoon. Check rates & book your stay at Amber Light Villas! Altemar Suites (Fira) — Boasting beautiful views and an outdoor hot tub to admire them from, you can’t go wrong with the price, creature comforts, or excellent location near the center of Fira with a stay at Altemar Suites during your honeymoon in Santorini. Callia Retreat Suites — Want to ensure that you’re staying at an adults-only property on your Santorini honeymoon… or just want access to the epic pool at this hotel? Head to Callia Retreat Suites. 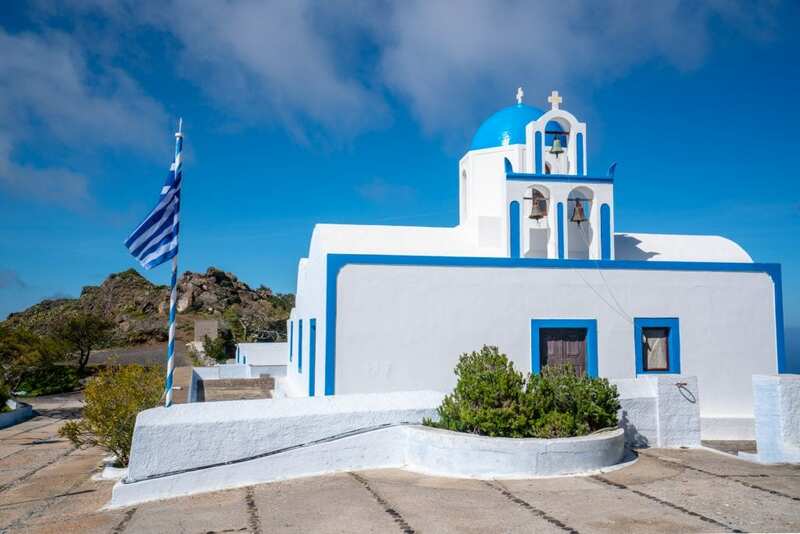 Located in the heart of Fira, you will be able to access the heart of the town while also maintaining a peaceful getaway. For extra romance, choose a room with a private hot tub! Check rates & book your stay at Callia Retreat Suites! Let’s be honest: Santorini is always a bit of a splurge. As a tiny speck of an island in the middle of the Aegean Sea, even getting there is usually a bit of an investment! 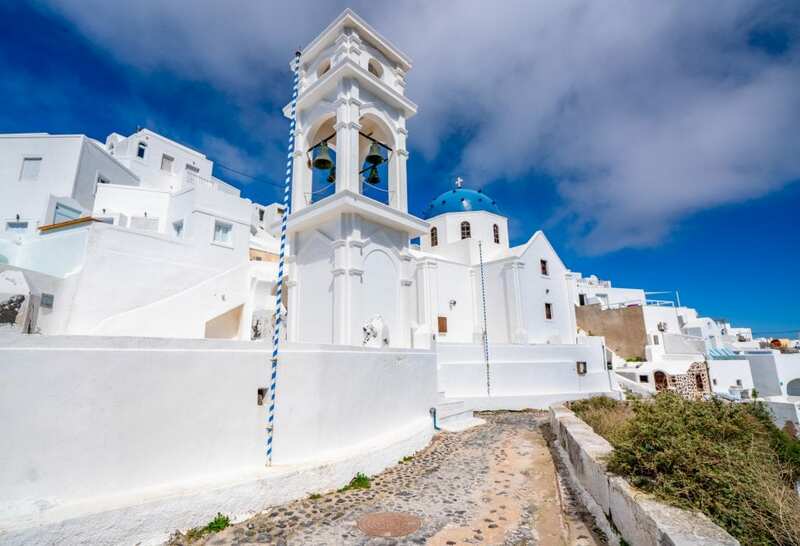 That being said, you can save significant amounts of money on your Santorini honeymoon by opting to travel in shoulder season, specifically March and October. 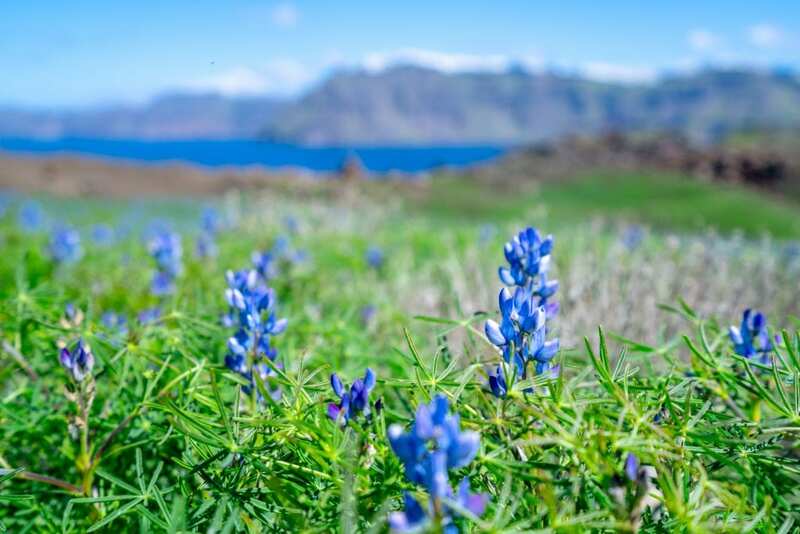 Prices will be a bit lower, and hotels will sell out a bit slower–but in exchange, the water will probably be too cold to swim (especially in March–in October, at least, the sea has had all summer to heat up). April and September, while technically shoulder season, see more crowds and higher prices than if you push out your itinerary one more month. 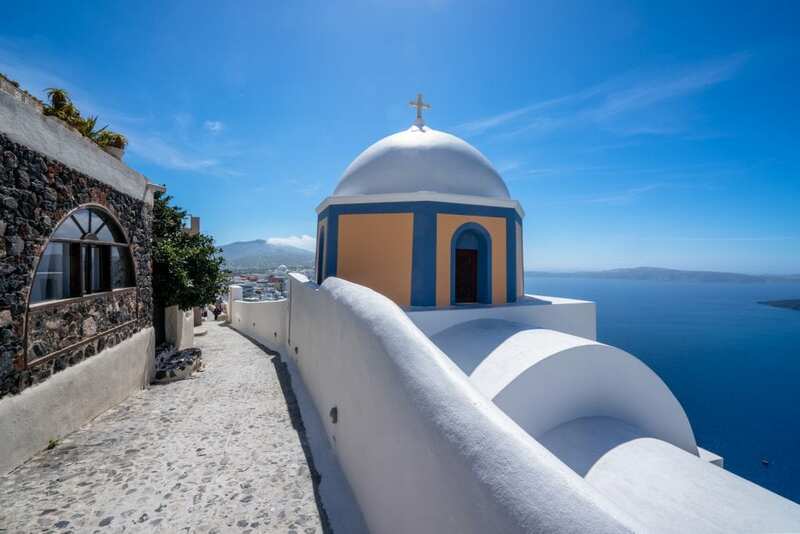 May through August is the warmest time to visit Santorini, but also when crowds and prices will be at their very highest, with the absolute peak coming in July and August. While Santorini is beautiful at any time of year, unless you and your spouse don’t mind bundling up and avoiding the water, we’d recommend avoiding scheduling a Santorini honeymoon between November and February, when the weather is cold and much of the island–including the amazing hotels that can make a honeymoon in Santorini extra special–are closed for the season. 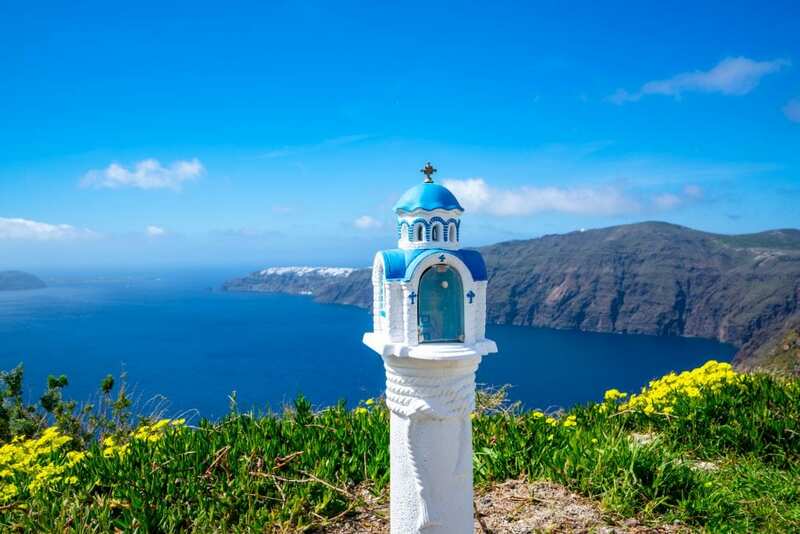 Depending on whether your Greek honeymoon is focused entirely on Santorini or you’re making Santorini one stop on an island-hopping itinerary, you’ll probably have a different ballpark figure for how long you want to spend on Santorini–and the good news is, there’s really no wrong answer. Even one day in Santorini is worth a visit, but we promise you’ll want to stay longer than that! 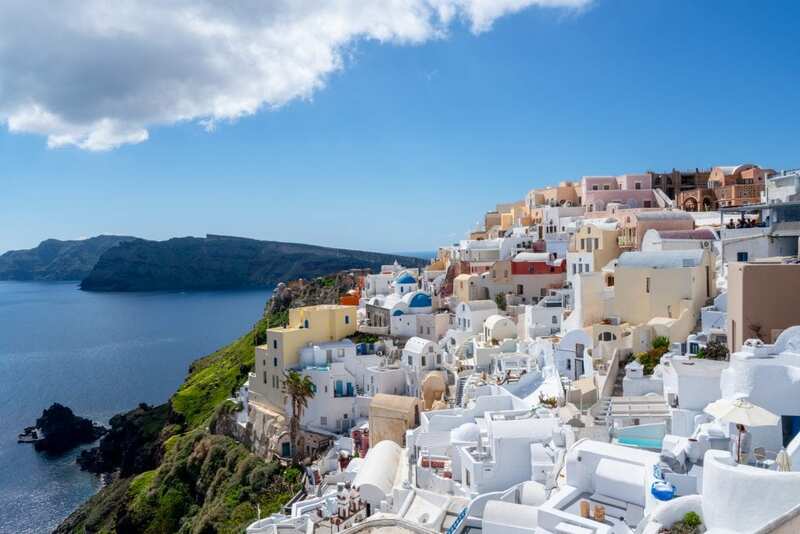 To get the most out of what the island has to offer, we recommend spending a minimum of 3 full days in Santorini if at all possible, and you could easily spend a slow-paced and delightful week there without a problem. Sunscreen — Because sunburns are definitely not a good look for your Santorini honeymoon photos. Travel Journal — Take it from someone who desperately wishes she had kept a journal on her honeymoon and had those memories preserved in real time: it’s worth taking at least a few notes during your honeymoon in Santorini. For something with a low level of commitment, I can’t recommend the One Line a Day Journal enough–I’ve been using it for more than a year now and adore it! It’s definitely an idyllic honeymoon destination! It’s an incredibly romantic place.